Of all the survival equipment that you can buy, a perfect survival knife is the single most important tool. While all those other tools are nice to have and make survival easier, many of the functions that we use them for can actually be done with a knife, even if they are easier with the correct tool. But there is nothing that can take the place of the best knife unless it’s another knife. So the natural question is, “What is a survival knife?” Before you believe anyone’s adds about their “ultimate” survival knife, what makes a knife a survival knife is how you use it, not some particular style. Pretty much any knife can be used to help you survive if that’s all you have available. But ideally, there are a few things you want in the knife that you select to use for survival. Mostly, you want quality. Many knives which are marketed as survival knives combine the knife with an assortment of other “survival gear” such as fishhooks, fire starters, and band-aids. I even have one that has a slingshot built into the sheathe. Just keep in mind that every dollar the manufacturer spends on these “extras” is one less that they are spending on the knife itself. So to keep those knives competitively priced, they use lower quality steel and other materials. Good knives are about the steel, not the gimmicks that are thrown in with them. Good quality steel will sharpen to a finer edge, hold that edge longer and the knife overall will last longer under more rugged conditions. A cheap knife will never hold an edge, mostly because it is made with cheap steel. Most knives today are made of stainless steel. This is great in that it prevents those blades from rusting. If you’re going to be storing a knife for a prolonged period of time, such as the knife in your bug out bag, then it’s good to have stainless steel. But the problem with stainless steel is that it doesn’t hold an edge as well as high-carbon steel. So the trick ends up being selecting a knife steel that gives you the best combination of characteristics for what you need. Actually, this decision is made by the knife manufacturer. Still, knowing it will help you understand how good a particular knife is and how well it will function for you. This chart provides a good overview of the most common knife steels. Damascus steel knives have become popular in recent years, mostly due to their beauty. What makes Damascus steel unique is the laminating process which allows two different types of steel to be used together in one knife. One type is high carbon, providing the fine edge and edge holding capability, while the other provides the overall strength for the knife. However, they are mostly decorative and may not make the best survival knives. The next most important factor is how the knife is constructed. While folding knives are convenient, they all have one common flaw; they can break. The weak point in the knife’s construction is where it connects to the handle. While that may last a lifetime of normal use, the stress of survival tasks could very easily cause that weak point to break, leaving you without a knife. For this reason, a survival knife should always be a fixed-blade knife. While that may not be as convenient to carry around with you, it will make up for it in the ways you can use the knife. But it’s not enough that it’s just fixed-blade, it needs to be a “full tang” fixed blade knife. The tang on the knife is the part of the blade that extends into the handle. Cheap knives use a short tang, often molding the tang into the handle. This creates the same sort of weak point that exists in a folding knife, only weaker. I’ve seen many a knife like this break when using it for nothing more important than cutting a piece of cheese. A full-tang knife will have the tang extend through the entire length of the handle. This could take on a variety of different forms, but the key part is that it goes all the way through. That prevents the blade from breaking off from the handle. No knife with a hollow handle is going to have a full tang, no matter what the manufacturer claims. The laws of physics still apply, and the laws of physics say that two objects can’t occupy the same space at the same time. So the tang can’t exist in the hollow space. About the best you can expect in these cases is that the blade is welded to the steel tube inside the handle. But no matter how well it is welded, it’s not as strong as a full tang. The blade’s thickness is an important indicator of quality as well. As a general rule of thumb, higher quality knives will have a thicker blade than inexpensive ones. This is useful in a survival situation, where the knife is likely to be misused for a variety of purposes. The thicker blade is less likely to bend or to break in those circumstances. This third characteristic of knife construction is the one that everyone looks at. However, it is nowhere near as important as the blade material and construction. Nevertheless, blade shape, or blade geometry as it’s sometimes called, is important, as those shapes are created to make the knife useful for a variety of different tasks. Some knife geometries are better for some tasks, while others are better for other tasks. I’m not going to go through all the common shapes here, just the ones which work out the best for survival knives. Other knives styles, such as daggers and spear point, are designed for other purposes, like fighting. While you may end up fighting with your knife, that’s not its main purpose. The Drop Point is probably the most common style of knife used as a survival knife. While providing a point for piercing material or stabbing, the point is not so sharp as to become easily breakable. With a curved belly, it is good for a variety of tasks, such as skinning animals and whittling. The Clip Point provides a sharper point, making it better for piercing. However, the thinner profile means that the point is easier to break off. So, while it is good for piercing tarps and skins for putting a shelter together, there is a chance of breaking that point off if you try to pry with the knife or use it to dig a hole. Many clip point blades have a convex back, making them sharper and weaker. The Tanto is a newer style of the knife blade, fashioned after the Japanese Katana, which has a similar point. This is an extremely strong point, making it extremely good for stabbing. Since the blade maintains the same width throughout most of its length, this is one of the strongest blade geometries that you can find. However, the lack of a curved belly makes it difficult to use this type of blade for skinning. 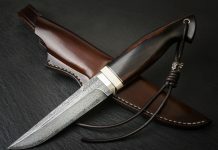 In all these styles, you will find some knives with the edge sharpened the full length, as in the first two knives shown above, and others in which part of the blade is serrated, as the Tanto blade is. This is a matter of personal preference. Some call this a “saw blade,” but as you can see, it’s really too short to saw through much of anything. however, a serrated blade is useful for cutting some types of materials, such as rope. While the blade is the most important part of any knife, a good handle will make the knife much easier to use. You need a handle that’s comfortable in your hand, as you will actually be using the knife. This is different for cutting than it is for stabbing; as well as different for skinning game, then it is for fighting. So it’s a good idea to play with a number of different knives, before settling on a particular style. Many modern knives are made with molded handles, rather than wood, bone, antler or even plastic. This allows a softer handle, making the knife more comfortable to use over a prolonged period of time. This can be useful in a survival situation, where you may find yourself using that knife for hours at a time.